Install and configure novaPDF from command line. 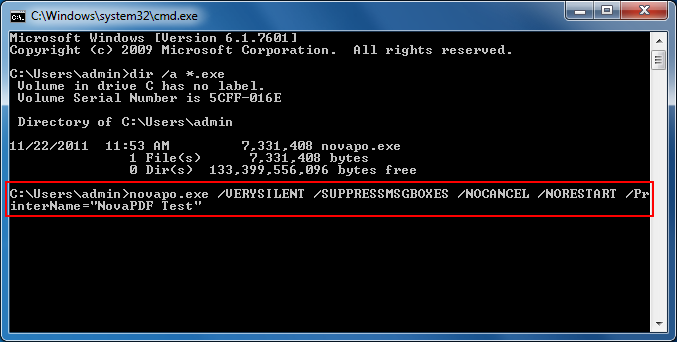 novapo.exe /VERYSILENT /SUPPRESSMSGBOXES /NOCANCEL /NORESTART /PrinterName="novaPDF Test"
will rename the novaPDF printer (as it will appear in the Printers list) to "novaPDF Test"
/SILENT, /VERYSILENT - Instructs Setup to be silent or very silent. When Setup is silent the wizard and the background window are not displayed but the installation progress window is. When a setup is very silent this installation progress window is not displayed. Everything else is normal so for example error messages during installation are displayed. If a restart is necessary and the /NORESTART command isn't used (see below) and Setup is silent, it will display a Reboot now? message box. If it's very silent it will reboot without asking. /SUPPRESSMSGBOXES - Instructs Setup to suppress message boxes. Only has an effect when combined with /SILENT and /VERYSILENT. /NOCANCEL - Prevents the user from canceling during the installation process, by disabling the Cancel button and ignoring clicks on the close button. Useful along with /SILENT or /VERYSILENT. /NORESTART - Instructs Setup not to reboot even if it's necessary. However, If the novaPDF installer requires restart it would be advisable to do so (restart is required when the installer needs to replace some dll files and cannot do that because they are in use by the system). /DIR="x:\dirname" - Overrides the default directory name displayed on the Select Destination Location wizard page. A fully qualified path name must be specified. /GROUP="folder name" - Overrides the default folder name displayed on the Select Start Menu Folder wizard page. /LANG="language" - Specifies the language to use for the installation. When a valid /LANG parameter is used, the Select Language dialog will be suppressed. /DefaultLang="language" - Specifies the default language. Use short language codes (exactly as those listed for the /Languages parameter above) or the REGST constant for Use regional settings option. /PrinterName="printer name" - Name of the installed printer. By default the name is "novaPDF v5"
/Default - Instructs setup to set the printer as default printer. /NoInstallIfExists - Instructs setup to check if a novaPDF, with the same name, is already installed. If it is, it does not start the installation. When installing novaPDF, a Start Menu folder will be added for novaPDF. There will also be a menu item for the uninstaller. How to add/remove a temporary PDF printer each time my application creates the PDF? Hide novaPDF printer in the list of Printers when printing via novaPDF SDK.